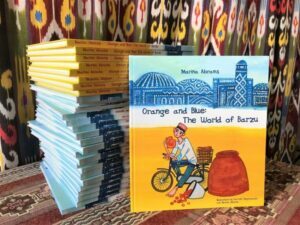 Author Marina Abrams introduces Central Asia through children’s literature in her new book Orange and Blue: The World of Barzu. The story is told through the young boy, Barzu, who lives in the mountains of Tajikistan, and who visits his grandmother. The book is vibrant, featuring the work of prominent Tajik artist Farrukh Negmatzade. Colorful depictions of clay ovens, sun-dried fruit, delicious bread and grandmother’s tale of the merchant Faiz who travels to Hindustan, invite children and all readers into Central Asian lifescapes. Please join us along with Central Asia diaspora representatives: Dr. Togzhan Kassenova, Non-resident fellow, Carnegie Endowment for International Peace; Nodir Zakirov, Board of Directors, Uzbekistan Youth Association in America; and Firdavs Nazarov, Outreach Manager, Tajik American Cultural Association for an afternoon celebrating Central Asia culture. Light refreshments will be served. Marina Abrams was born and raised in Kazakhstan, has lived in Tajikistan and Russia, and traveled extensively around the Eurasia region. She is an international policy professional with fifteen years of experience in multi-disciplinary projects and nonproliferation initiatives dealing with terrorism, the physical protection of former nuclear and biological warfare (BW) facilities, and employment issues for former BW scientists in Russian Federation and Central Asian states. Prior to founding Barzu World, Marina worked at the Center for Nonproliferation Studies, Monterey, CA and Global Green USA (Washington D.C.). 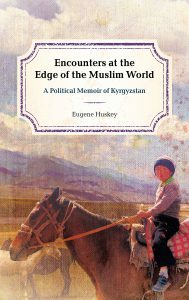 Drawing on three decades of research and travel in Kyrgyzstan, Encounters at the Edge of the Muslim World: A Political Memoir of Kyrgyzstan takes readers on a journey through the unlikely birth and tumultuous development of Central Asia’s most open society. With citizens of independent Kyrgyzstan stripped of their Soviet identity, the book illustrates how alternative loyalties based on kinship, geography, statehood, and religion competed for prominence in ways that often complicated the new country’s political, social, and economic development. Unlike Huskey’s earlier academic work on Kyrgyzstan, this book employs first-person narrative to tell the stories of leaders and citizens trying to navigate the transition from communism, where identities, property, and the rules of the political game were constantly in dispute. Dr. Eugene Huskey is the William R. Kenan, Jr. Professor of Political Science at Stetson University. His research on Kyrgyzstan first took him to the country in 1992, six months after Kyrgyzstan’s emergence as an independent state. 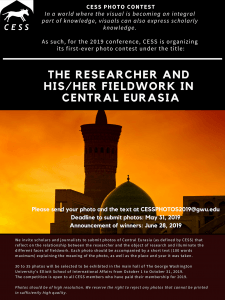 He has travelled to Kyrgyzstan regularly since then to conduct research, teach at the American University of Central Asia, train Kyrgyzstani political scientists, and participate in a mission for the International Center for Transitional Justice. Kadyr M. Toktogulov, Ambassador of the Kyrgyz Republic to the United States of America. Prior to his appointment, Mr. Toktogulov served as Press secretary to Kyrgyz Republic’s President Almazbek Atambaev. Before joining the Office of the President, he worked as Chief of Information Policy Department at the Office of the Prime Minister of Kyrgyzstan. 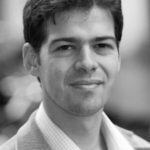 Mr. Toktogulov worked previously as a a correspondent for the Associated Press, Dow Jones Newswires, and contributed stories to the Wall Street Journal. He holds a BA degree in Journalism and Mass Communications from the American University of Central Asia. Xi Jinping announced China’s ambitious Belt and Road Initiative in Astana in 2013. Its land component – the Silk Road Economic Belt- aims to create transport corridors and increase connectivity from China to the west – through Russia and Belarus, and along roads and railways through Central Asia, Azerbaijan, Georgia, and Turkey. In this presentation, Daniyar Kosnazarov will analyze the projection of China’s soft power in Kazakhstan, and explain how a range of actors from countries are involved in this process. He will draw attention to the barriers which limit Chinese public and cultural diplomacy in Central Asia. Fuad Shahbazov will explain how in the South Caucasus, all three countries are interested in boosting cooperation with China to develop infrastructure projects. However, these ambitions are hampered by ongoing conflicts between the countries. China remains reluctant to become involved in regional conflicts, focusing instead on developing economic links and positioning the region as a gateway to Europe. As China continues to engage the states of the South Caucasus, this approach will be tested. Fuad Shahbazov is a Baku-based policy analyst and author. His expertise include regional security, religious extremism, and military and defense industries. He is currently at the Daniel Morgan Graduate School of National Security in Washington DC. He was a Research Fellow at the Center for Strategic Studies under the President of Republic of Azerbaijan from 2016-2018. He was also a Visiting Researcher the Asian Center for Strategic Studies in Istanbul, Turkey, as well a Research Assistant at the European Policy Center in Brussels. Mr. Shahbazov is also a frequent analyst for BBC, Al Jazeera, Times of Israel, Jamestown Foundation, The Diplomat, and Central Asian – Caucasus Institute. He holds an MA degree in Political Science from University of Bologna. Daniyar Kosnazarov’s research interests include youth, social media, and popular culture. 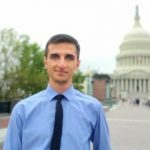 As a visiting fellow at The George Washington University, his research focuses on the values and higher education expectations of Kazakhstan’s Generation Z. Mr. Kosnazarov is also the Editor-in-Chief of Steppe, an independent digital media outlet in Kazakhstan covering technology, entrepreneurship, education, leisure, and art. 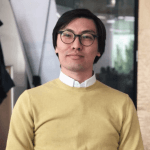 He is experienced working for both the government and private think tanks of Kazakhstan, and previously worked as Chair of the Department of Strategic Analysis at Narxoz University, evaluating strategy implementation. He previously was awarded an MA in International Relations and Regional Studies, Tsukuba University (Japan) 2012, and a BA in International Relations, Selcuk University (Turkey), 2009. Artemy Kalinovsky’s Laboratory of Socialist Development investigates the Soviet effort to make promises of decolonization a reality by looking at the politics and practices of economic development in central Asia between World War II and the collapse of the Soviet Union. Focusing on the Tajik Soviet Socialist Republic, Kalinovsky places the Soviet development of central Asia in a global context. Connecting high politics and intellectual debates with the life histories and experiences of peasants, workers, scholars, and engineers, Kalinovsky’s book investigates how people experienced new cities, the transformation of rural life, and the building of the world’s tallest dam. Kalinovsky connects these local and individual moments to the broader context of the Cold War, shedding new light on how paradigms of development change over time. Throughout the book, he offers comparisons with experiences in countries such as India, Iran, and Afghanistan, and considers the role of intermediaries who went to those countries as part of the Soviet effort to spread its vision of modernity to the postcolonial world.